Do you have a baker or chef on your holiday shopping list? I recently had the opportunity to review some products from Love Cooking Company and I am loving the variety they have available! There is no higher value than simply showing your loved ones that you care. Love Cooking Company was created to inspire more loving moments, which are made possible through our unique products that help you easily create special dishes. They recognize that every moment in the kitchen counts. That’s why we’ve created collections of unique bake ware and tools to make the process easier and more fun. From prep to serve, we’re with you every step of the way to make sure your dish is a success. Mrs. Fields Fill N Flip™: Create a surprise center by adding your favorite fillings to the inside of your cakes! Bake your cake in the Mrs. Fields Fill N Flip™ according to the recipe. When it’s cool, flip the cake over and add filling – pudding, fruit, compote, anything you choose! – to the side with the large opening. Then flip the non-filled cake on top, and you have an amazing layered cake your friends and family will love! Available in round and square pans. Love Cooking Gourmet Cutie Cakes™ Baking Pan: RV $14.99 Perfectly popable, treats baked in the Love Cooking Gourmet Cutie Cakes™ Baking Pan are the perfect bite-size indulgence. This pan has space to bake 48 bite-size portions of your favorite sweet and savory snacks. So whether you're hosting a tasting party or simply want to keep portions in check, this unique pan is just the right size! 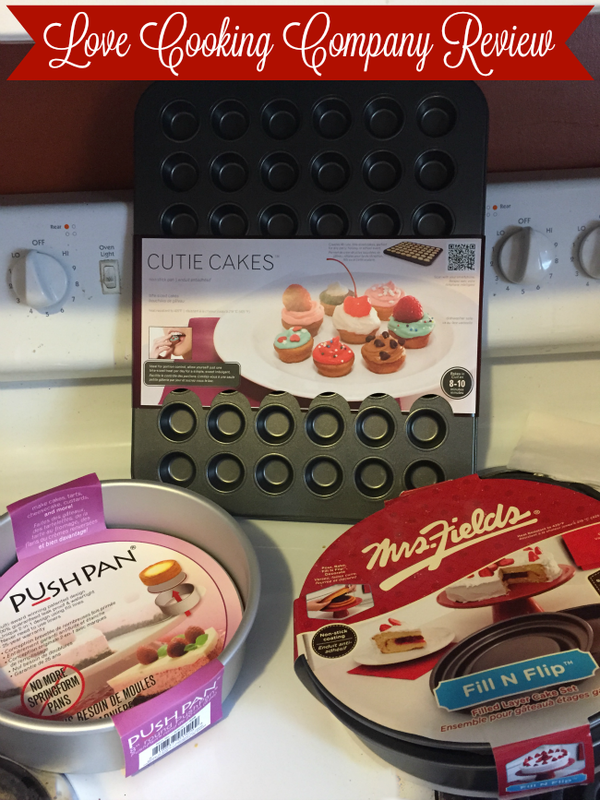 PushPan®: RV $14.99 Make delicious-looking cakes with the PushPan®! An alternative to a spring-form pan, the PushPan® is a 100% watertight and leak-proof cake pan with a patented, silicone-lined removable base. The silicone seal is so powerful that the pan doesn't require foil wrapping or lining, even when baking a cheesecake in a water bath. Offered exclusively through Love Cooking, the PushPan® creates desserts that never disappoint! DO you like to bake during the holidays? What do you think of Love Cooking Company? I received complimentary products to provide this post. All opinions are my own. If you would like to see your product featured in our Holiday Gift Guide or sponsor a giveaway event, please contact us. Wow, I love that push pan!! I make cheesecakes and I can't tell you how many messed I've had to clean up!! Love the fill and flip pan!! So neat!! I love anything filled with amazing filling and this would make creating it so easy!! I really like the fill and flip, I think I would end up using that a lot. I can think of tons of things to make with it. Wow, I really like that flip pan!! No ore worrying about how big a build up on the sides I need! I love these pans. The cutie cake and push pan are unique and great to keep if you're a baker. I love them all!